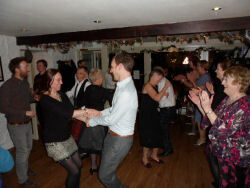 We just love Hogmanay at The Pierhouse. It's a lot of hard work for the team, but the atmosphere is second to none and our guests tell us how much they enjoyed the night. There was the 'fantastic' 5 course dinner, brilliant company, dancing to the ceilidh band and, to top it all, a stunning firework display off the pier after singing Auld Lang Syne at the bells of midnight. 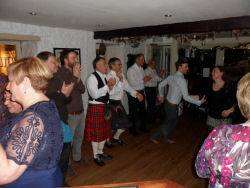 Huge amounts of revelry and fun had by all 69 people - a lovely mix of hotel residents and local people. For the second year running, we even had a marriage proposal in the hotel - is popping the question at Hogmanay turning into a Pierhouse tradition? We do hope so! Many congratulations to the happy couple, Stephanie & Kirk! Many thanks to all who came along to The Pierhouse Hogmanay celebrations - we hope you have a fun-filled 2015!